New Listing on Upper Gresham Lake! Escape to the Northwoods and find yourself at Harmony Point in Boulder Junction! Nestled among the pines on Upper Gresham Lake, this private oasis offers panoramic lake views from many rooms in the house. Perched on one-acre of land, Harmony Point is the perfect place for families and friends looking to come together and relax. This 4 bedroom, 3 bath home has everything you need with modern amenities and plenty of space to relax and play, all while maintaining that classic "up north" feel. Harmony Point offers easy access to a private sandy shoreline and dock – bring your boat and stay awhile. The outdoor experience offers enjoyment for all types and activity levels. Relax on the wrap-around deck and watch for bald eagles and loons, or take a dip in the lake and enjoy the sunshine by exploring this chain of three lakes by canoe or kayak. For adventurers, Upper Gresham also offers world-class fishing and waterskiing! Inside Harmony Point, the main level accommodates four adults in two bedrooms: a king-sized master bed and spacious sitting area and a second bedroom with a queen bed. The main level also includes two full-baths, a newly remodeled kitchen and a combined living and dining area with spectacular views of the lake. The fully-appointed kitchen is large enough for families to gather, leaving plenty of room to prepare meals together. On the lower level, the two bedrooms accommodate up to 6 people. There is one queen bedroom walkout to the lake and one queen bedroom with a two-twin bed trundle and an adjoining bathroom. This level features a full bath (w/bathtub), and free-standing wood fireplace. Additional home features include a washer/dryer, fish-cleaning station with running water, a large flat screen tv, and a back-up generator system should a large storm roll through. 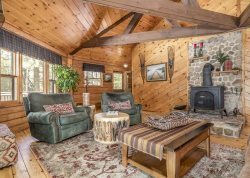 Harmony Point is just a 15 minute drive from heart of Boulder Junction, Manitowish Waters, or Minocqua, perfectly located, yet provides the seclusion you need to truly unwind. All three towns offer charming main street shopping, cafes, eateries, ice cream shops and friendly bars. In addition, summer visitors can explore nearly 50-miles of scenic hiking & cycling trails through the pristine Northwoods or try their luck fishing any of 80 local lakes. Winter visitors may spend an afternoon ice-skating and sledding, enjoy world class snowmobiling, miles of groomed or back-country skiing and snowshoe trails. Bring your boat to dock on the private pier or rent one from us! You all do a great job. The house is great - so is the lake. Id love to find something to purchase close by. The layout of the house is a little strange but you get used to it and it works. The main room is great - tv is perfect there and great views. Finish the basement hallway so it feels less like you decided to put 2 bedrooms in the basement and more like the first floor. Thanks for your review.. We will pass this on to the homeowners. Upper Gresham Lake is a 362 acre lake located in Vilas County. It has a maximum depth of 32 feet.Visitors have access to the lake from a public boat landing. Fish include Musky, Panfish, Largemouth Bass, Northern Pike and Walleye.The lake's water is moderately clear. Check out Upper Gresham Lake!